Traveling south from Auckland to the Southern Lakes district, you will pass through New Zealand's ever-changing natural landscapes. See the rocky and beautifully desolate Tongariro National Park, experience the peaceful stillness of the Marlborough Sounds, and be amazed as you arrive into the alpine wilderness of the Southern Lakes. Along the way, take the opportunity to enjoy wildlife encounters in Wellington, Kaikoura and Akaroa, where native birds and other animals abound. 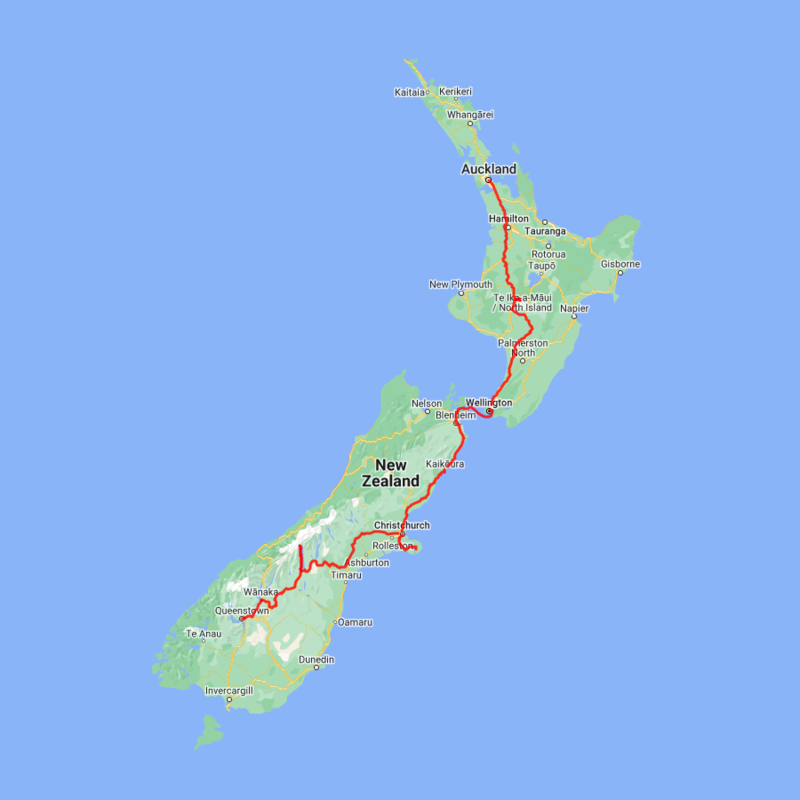 You can expect to spend around NZ$251 in fuel cost on this itinerary based on an intermediate sized car. Akaroa and the Banks Peninsula offers a great contrast to the South Island's largest city. An easy 1 1/2 hours drive from the city centre are rolling green hills, streams, golden sand beaches and small settlements that offer a unique insight into New Zealand's history and development plus, wineries, great cafes and restaurants and abundant wildlife. Just on the other side of the Port Hills is Lyttelton, a busy port town that was crucial to the development of Christchurch and the Canterbury Plains. Following the road around the beautiful natural harbour the names, such as Magazine Bay, Battery Point, Corsair Point and Governors Bay, remind of the importance the navy placed on this harbour. The Banks Peninsula is actually the remains of a long extinct volcano, the rim of which collapsed some time ago allowing the sea to flood into and create what is now the Akaroa Harbour. In 1840 French colonists settled in Akaroa in a bid to stake a claim for the South Island. Unbeknown the British had already declared sovereignty and a long drawn out dispute ensued with the British eventually being given government. However the French stayed and made this stunning part of the South Pacific their home and still to this day the town boasts French street names and every year a French Festival is held. The Harbour itself is teeming with wildlife and a nature cruise is a must do activity. One of the world's smallest and rarest dolphins, hectors dolphin, are often seen and cruises also offer excursions with the chance to swim amongst them.